This is my desk chair. It was in a photo on a previous post I did about organizing my creative space. You can find more in my post, here, Getting Organized. A few of you asked me if I was going to do a post about the chair. Here is the chair as I am taking the simple slipcover I made for it off the back. You can see the typical office chair fabric on the back, not my style. I kept the polka dot fabric on for the photo, but that has the red fabric underneath, too. I bought the chair because it was the right price and had lots of cool ergonomic features that I wanted. I knew the minute I got it home it would be getting a makeover. I keep a stash of leftover fabric from previous projects and this black and white check and polka dot are from that stash. I didn’t have enough of each to do the seat and back in the same fabric so I picked both since they coordinated. You can see the slipcover I took off for these photos draped over the arm. I made the slipcover with my circa 1950’s Singer. I am not a sewer, but this machine given to me by my mother-in-law works like a charm. I like the surprise of a little detail, so I added striped piping. I didn’t use a pattern, I just took the back measurements and made a “pillow case” style cover to slip over. The back of the chair is slightly curved and I wanted it to look fitted, so I kept putting it back on (inside out) and pinning it, sewing more until I was happy with the fit. A rectangular or square back chair would be easier. For the seat, I un-screwed it and took it off the chair to make it easier to cover. I simply cut the fabric to size plus extra to wrap around and staple to the underside of the chair. I made sure the fabric was taut and lined up as I stapled. I am a display designer and our motto is “Whatever you can’t see can easily be faked or not so pretty”. I did try to be a bit neat by folding the fabric under as you would a hem so no unraveled threads would show. Much better than the office fabric underneath. When it gets dirty it is easy to take off and clean. I should tell you that any fabric would do. The polka dot on the seat is silk. The check is cotton duck cloth. 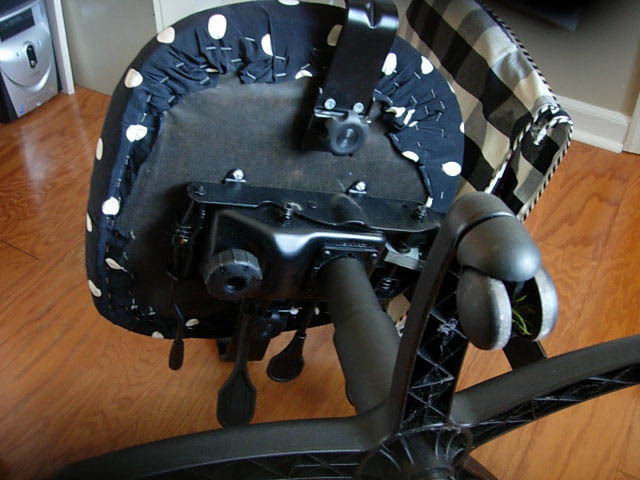 Heather from My Frugal Family left a comment about her chair having a plastic back and not being able to cover it. The following photos are of the chair I have on the opposite side of my partners desk. 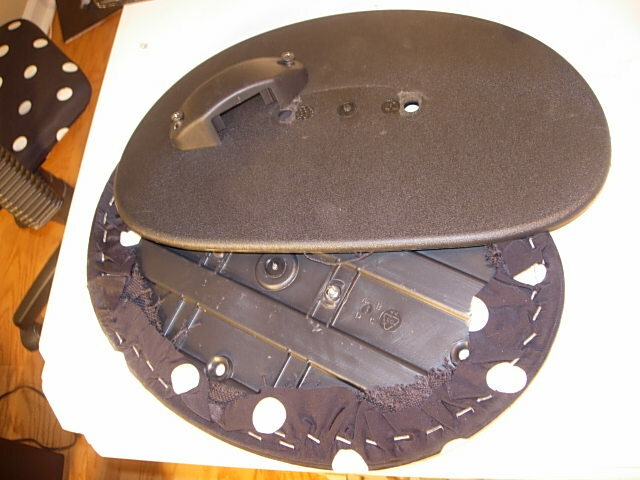 It is from IKEA with a plastic back. 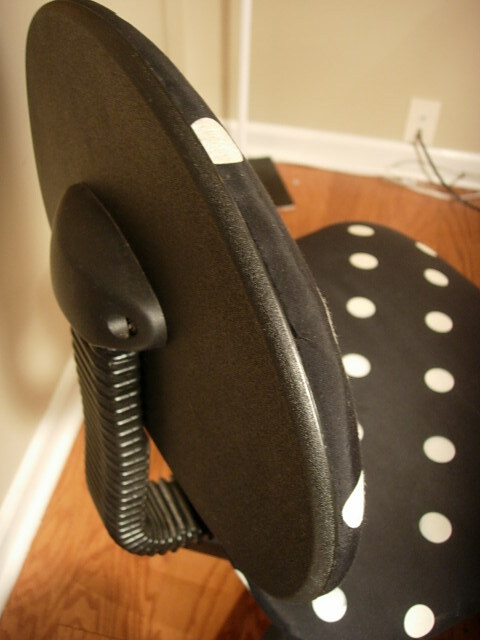 If you have a chair that looks like this, you can still cover the bottom in the same way as directed above. 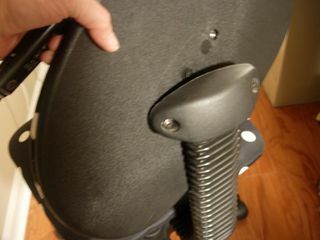 Depending on your chair you can unscrew the back and carefully pull the plastic back from the upholstered front. 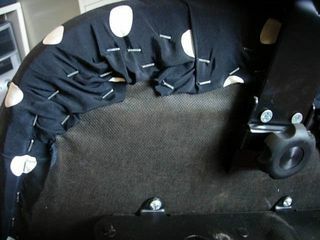 Then cover the upholstered side and snap the two sides back into place, then screw the whole thing back onto the chair. There are 4 of these snaps. Line up the front and back and place on a hard surface and press hard until you hear all 4 snap back into place. If you would like to see how I made my chair over again in green and white fabric check out this post: How to Make Over an Office Chair I used paint and a throw rug…YES a throw rug! Great post Diane! 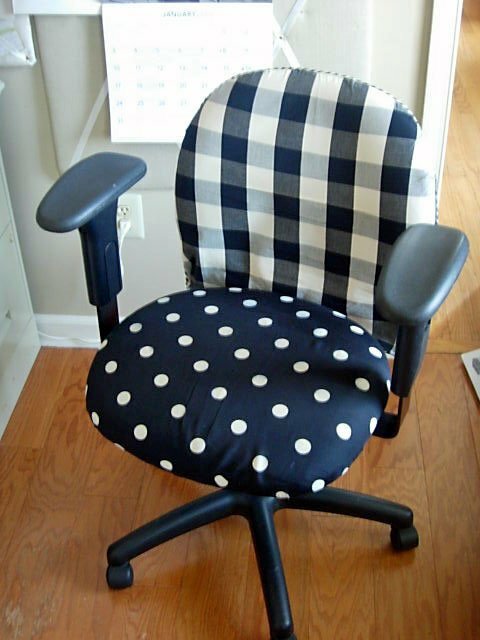 I must do this for my black office chair in my sewing room. I’ve been in the process of freshening up my space using lighter and brighter colors. It really helps pick up your mood. I like how you mixed different fabrics, great idea, thank you for sharing! I would like to get more of your great ideas. “sew” simple, but such a great idea. thx for the inspiration. I will need to follow you and your DIY ideas. I too covered the ugly old computer chair in my office but I went a step further and I used elastic on all pieces including the arm rests. This enable me to take it off and wash it as necessary since my cat likes to sleep there when I’m not in the chair!! Hi Cathy – Great idea to cover the arms. I have a cat, too and know how they like to cuddle on a soft warm surface and then leave all their hair behind. first. If you like to be competitive you can do so by competing against other kids across the country. relatives also have a positive impact on our relationship. This is FABULOUS!! I need a desk chair and wanted something with flair, but without the “flair price”. 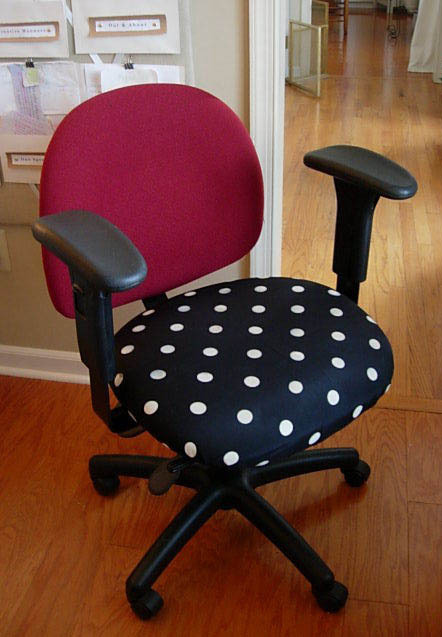 Now I’m just going to buy a regular desk chair and do the fabric myself! THANK YOU SO MUCH!!! I love the combination you used. 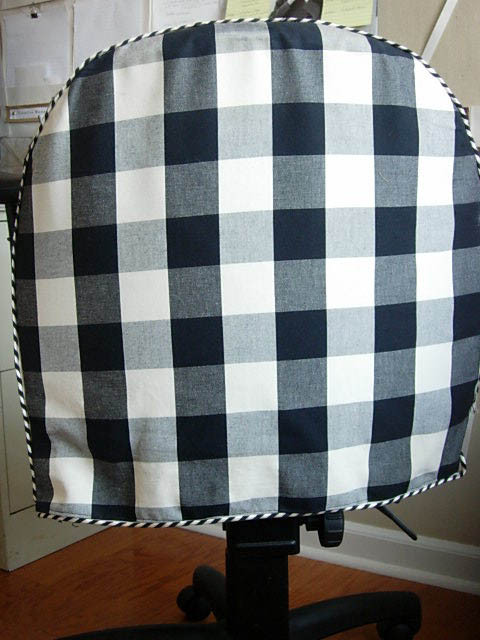 I was thinking you could also make a elastic edged seat cover that pops on and off for cleaning (similar to those round covers made for bar stools). You totally inspired me with this! I didn’t take a “before” photo, but trust me, it was pretty awful. 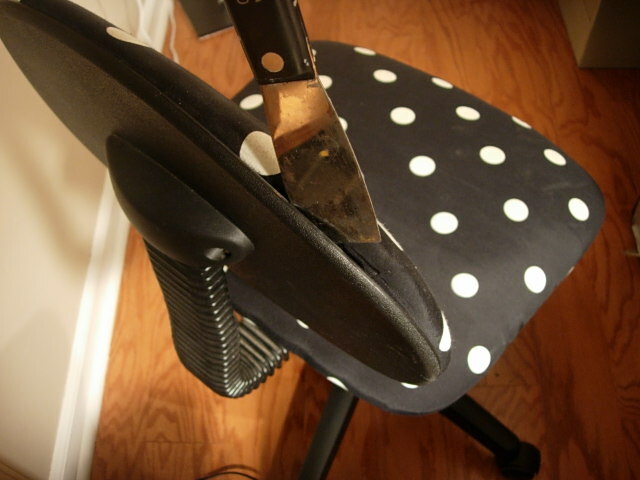 My mom has an old office chair she keeps trying to give me… I have pretty fabric… and a staple gun! *squeal* I’m going to have a pretty, new chair soon!! Thank you!! Love your blog! I just recently discovered your blog and I went back and read every post. 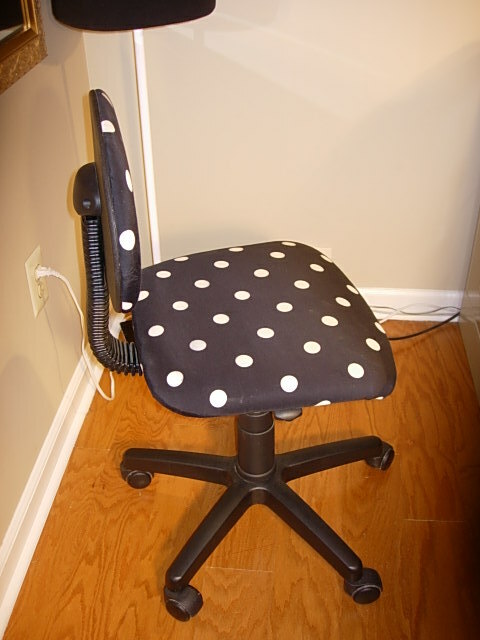 This post was extremely helpful as it gave me an idea of how to recover an office chair that is in my sewing room. The seat was stained and no amount of cleaning was budging that stain. Argh! I’ve wanted to recover it, but could not figure out how to recover the backrest. Your ‘pillowcase’ idea was brilliant and it was the solution I needed. I began to recover my chair last night and I’m 90% done – just need to put the trim on now, but I wanted to thank you. what a cool idea. I have a pretty office with a not so pretty chair. its an office chair amidst my frenchy stuff!? I will have to do a slipcover~thanks for the idea! ANd thanks for coming over to my place. You really come up with great solution for those office chair. I really love it and ill try it right away. I jumped over from Friday Follow and noticed this post, great idea! I can’t wait to try it out myself! Just found your blog and love this chair cover idea and it’s in my favorite color! I think you should just do it. He might love it, or if he is like my husband, he won’t even notice the change right away. You could drape the fabric over it for a few days until he gets used to it, then make the covers. very cute! i wonder if my husband would mind if i girlie up his ugly desk chair…i guess i could use more masculine fabric, but what fun would that be! :) LOVE it! I am a sucker for polka dots. Great thinking on the slipcover for the top half! I think I’d have to do that, as well, since my top doesn’t come apart, and has a plastic back, and arms. I am sooo tempted to try to recover my chair soon! I love this and have the same chair. Ive wanted to cover mine too. But looking at yours, well I dont have a staple gun but I think Id put elastic around the edge and slip it over the seat. It should stay put then I think. Hi Everyone – Thanks for the comments. Dawn, if you don’t have a sewing machine, you could try using fusible web to make the slipcover. I once made chair back slip covers this way. You would cut the fabric the same, but instead of running stitches along the seams, you lay in the fusible tape along the seam line and press. It works very well, but you can’t add piping doing it this way. I love the fabrics you chose!! The office chair looks so much better. Why didn’t I think of that?!?! Very creative! I’ve been considering doing this with my office chair for sometime, and now you’ve reinspired me. Great job! 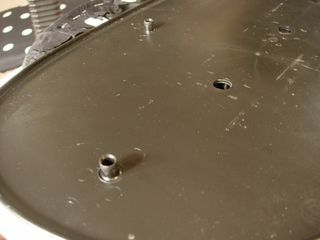 What a clever and creative fix to the duldrums! Thanks for sharing. This is a very good idea. I love the way they turned out. I could use something like this on my office chair. Oh I so totally love the dots and checks! This is great! 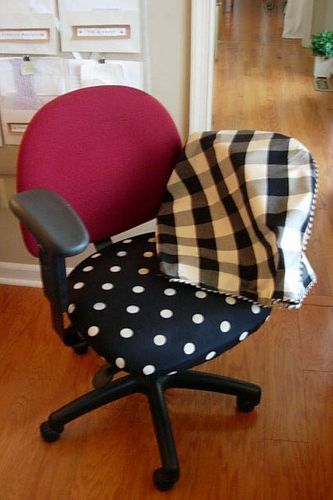 it’s so cute, I’m totally going to do that to my old office chair! 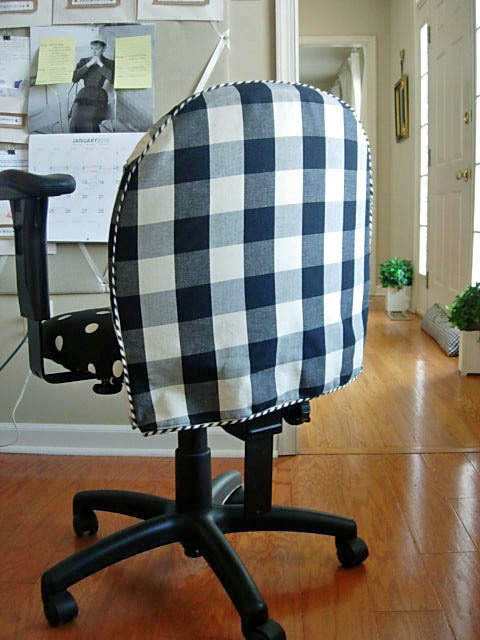 THis is such a great idea for an office chair! Why do they make them so very ugly!?? I love the polka dotted fabric too! I love that you like me feel everything should be pretty not just functional. I did something like this a few years back, but mine was more of a slip cover for both pieces. The funny thing is the seat cover had fringe around the bottom and my girls would steal it and wear it as a wig, I should have stapled that bad boy down. Live and learn, live and learn. Thanks for the lesson, I will know better next time. What a smart idea for an office chair! I would love for you to link up to my Slipcover Show-off party later this evening. Love it! They always put such ugly fabric on these chairs. You think they’d catch on and make them a little nicer. I think you came up with a nice solution!